They don’t call them ‘Team Resilient’ for nothing. 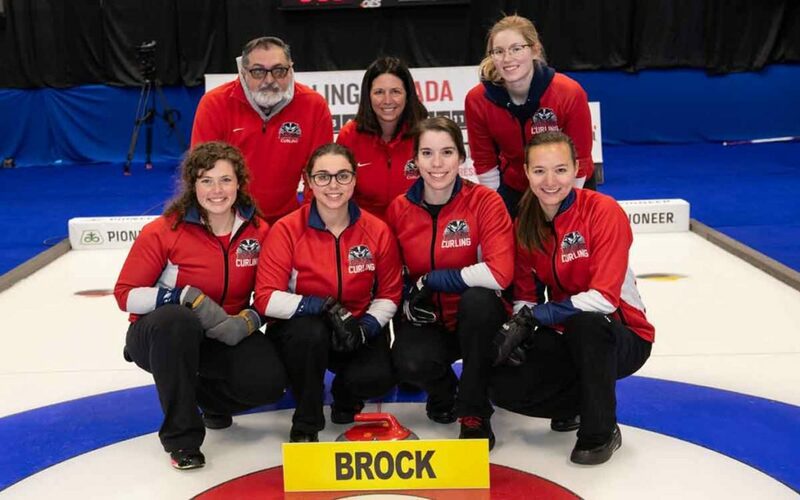 The Brock University’s women’s curling team proved why they’ve earned the moniker by securing a silver medal at the national university curling championships Tuesday. This is the second consecutive year the women’s squad brought home a medal from the U SPORTS Curling Championships, this time held at Willie O’Ree Place in Fredericton, N.B. Both teams made few mistakes in the faceoff and the skips were strong with their last stones, which resulted in a low-scoring game with not a lot of big opportunities to widen the scoring gap. Laurentian never trailed, winning 7-5. The Badgers read the ice well early in the match, but Laurentian led 3-0 after the first end. Back-to-back sharp throws by senior skip Terri Weeks late in the second diffused all of Laurentian’s plays and allowed the Badgers to keep the hammer heading into the third, where they brought the score within one (3-2). Weeks made a difficult throw to destroy the guards Laurentian built in the fourth, but the Voyageurs registered a point with a calculated throw. “We stayed really resilient after an early deficit and just stayed positive and kept working,” said Weeks. Voyageurs skip Kira Brunton continued to restore Laurentian’s lead by two every time Brock pulled within one. “We tried to take advantage of our opportunities to score, but the Laurentian team played really well and we kept trying to put pressure on their skip and she made a pistol on her last rock to win the game,” added Weeks. Holding the hammer in the ninth, Brock’s first-year vice Claire Randell tossed a pair of dynamite throws to put Brock into the red, with the Badgers trailing 6-5 into the final end. At the banquet, Weeks was named a First Team All-Canadian and Brock men’s team lead Doug Thomson was named a First Team All-Canadian. The women’s team consists of Weeks, Randell, second Marcia Richardson, lead Jillian Page, fifth Laura Henderson and alternates Sarah Bailey and Cassie Barnard. The women’s assistant coach is Karen Heywood. The Badgers, who curl out of the St. Catharines Golf and Country Club, enjoyed a successful curling season. The women’s team went 5-2 in the round robin and overcame Queen’s 6-5 in the semifinals. At the OUA championships, the women won bronze. The men’s team went 2-5 at nationals and won a silver medal at the OUA championships.